We hear a lot about the coming of driverless transport trucks, but where might they first enter common use? Well, perhaps in Sweden. That's the home country of Einride, a startup that recently announced development of a sort-of-driverless electric vehicle known as the T-pod. Although plans call for T-pods to have some autonomous driving features, the camera- and telemetry-system-equipped vehicles will also be remotely controlled by operators working at driving stations located in central facilities. That way, those people could go home at the end of their shift every day, as opposed to being on the road for days or even weeks at a time – it would be not unlike the way in which military drones are currently piloted in real time, in places far from the actual war zone. Each vehicle should measure about 7 metres in length, and be capable of carrying 15 standard pallets worth of cargo. It will weigh 18 tonnes with a full load, covering a distance of approximately 200 km on one charge of its 200-kWh battery pack. The first full-scale prototype has just been unveiled, with road testing reportedly scheduled to take place later this year. Assuming that goes as planned, the first production T-pods should then start transporting goods between the Swedish cities of Gothenburg and Helsingborg – it's a distance of about 219 km, so they'll presumably have to recharge en-route. It is hoped that by 2020 there will be an "active fleet" of 200 T-pods, utilizing a network of roadside charging stations. 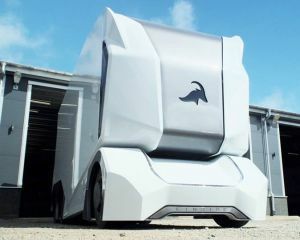 According to Einride, the vehicles will not only be quieter, safer and more eco-friendly than traditional transport trucks, but they should also more economical – they won't have cabs/sleepers, one operator could "drive" more than one semi-autonomous T-pod at a time, and transport companies wouldn't have to cover costs such as drivers' hotel bills.